This is probably something different from what you think when you read the headline of this article, but this is Saabs you all can make at home, that’s for sure! After making ice cubes all summer in my 92.001 ice cube tray from Saab expressions, I realized that I could use the tray for other things too. So what’s better then make some chocolate-Saabs? To be honest I did this for a few years ago too, but since I have very limited cooking-skills the result was discouraging. To explain what level I’m on when coming to making food – if I manage to boil some water without burning it it have been a great day in the kitchen… After some debriefing I came to that that I heat up the chocolate too fast and maybe to a far too high temperature, and it ended up very dry, hard and after a few hours it had a white shell. But shame on those who give up – to continue making 92.001 chocolate I have to buy some special tools. And one day, I saw a heater for making chocolate fondue in a gadget-shop. Since it was cheap (like 100 SEK / ~USD13) I thought it was worth checking out, so I bought it. So yesterday was the big day for some Saab candy production, and of course I don’t remember how much chocolate I needed for making to full trays, so I started with a 300g plate of milk-chocolate. The process matched my skills very well, simply break the plate into small pieces so they melt faster and put them in the 25W heaters pot and wait. When its ready I started filling the ice cube trays but as the pictures show I have to get something that can remove the leftovers to make a smooth finish. As you can see its not only at the Stallbacka factory they get short of materials – I simply ran out of chocolate after car no 16!!! 😉 So if you are planning to make some chocolate-Ursaabs, you will need about 20g of chocolate pr Saab. After this it was time to allow the Saabs to cool down, I let them stay in the refrigerator over the night, but I think 3-4 hours will be enough. In the first part of our article on future Saab models, Dimitri of Editions Atlas outlined the background surrounding the decision to produce a new series of miniatures, the Saab Cars Museum Collection. How do you go from a full-scale car to a scale model whilst remaining true to the features of the original car? 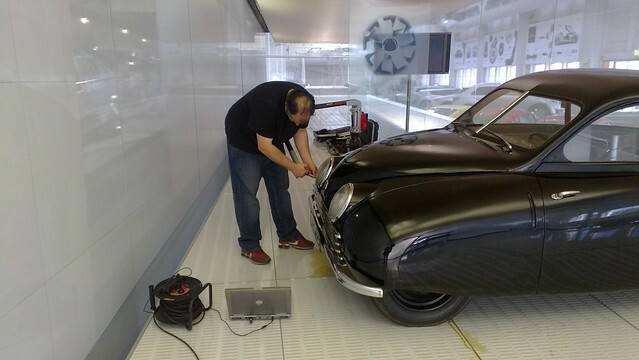 As far as accuracy is concerned, current technologies mean we now have previously unheard of possibilities within our reach thanks to the 3D scanner, which is what we shall attempt to explain here with the help of Dimitri, whose technical perspective on the matter we greatly appreciate. Snow Saab #3 – UrSaab! This is becoming quite a trend! I’ve just received another tranche of photos, this time from Henza in Lithuania. Henza’s been outside in the cold sculpting an UrSaab as his show of support for the sporting Swede. Thanks to Henza for sending in the photos. UrSaab UP!